All cells have cell membranes that control and regulate the passage of materials across their boundaries. The chemical nature of these membranes differentially restricts and promotes the movement of particles through them. Similarly, most organelles have membranes distinguishing their contents from the cytoplasm. The only membrane that prokaryotic cells have is a cell membrane. They lack all internal membranes, and therefore all membrane-bound organelles. It is important for cells and membrane-bound organelles to be able to regulate the inward and outward passage of materials. This helps them control their contents. While they are at the mercy of the Law of Diffusion, and will gain or lose ions and water because of environmental concentrations, they are dynamic in their ability to participate in this movement. Membranes have specialized proteins embedded in them that serve as transportation routes for certain substances into or out of cells. Sometimes this passage requires energy, but other times it does not. Many cells also require the ability to move large substances through their membranes—substances too large to pass through the biochemical structure itself. In cases like these, the membranes have to be chemically broken and reformed. Knowledge of membrane structure and the nature of the biochemicals present is essential to understanding how cells interact with their surroundings, and is the focus of the Membrane Function unit. 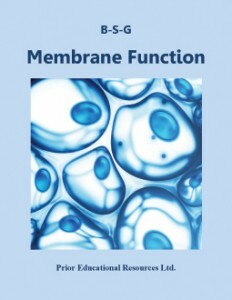 Membrane Function is excerpted from our Biology 12 Study Guide, which is the sixth edition of a student study guide written to match the curriculum of British Columbia. The concepts presented are applicable to the biology curricula of other educational jurisdictions as well.